Ownership / Access: Saunders-Watson family. Open to Public. Opening times. : Check their website for more info. Notes: Rockingham Castle is a former royal castle and hunting lodge in Rockingham Forest a mile to the north from the town centre of Corby, Northamptonshire. Rockingham Castle is often stated as being in the county of Leicestershire. This mistake arises due to Rockingham having a Market Harborough postal address, even though it borders directly onto the town of Corby in Northamptonshire. Rockingham village is part of, and is administered by Corby Borough Council. The Castle overlooks the villages of Rockingham and Caldecott and enjoys good views over the Welland Valley. Now privately owned, it is open to the public on certain days. Rockingham Castle was a popular haunt of writer Charles Dickens who was a great friend of Richard and Lavinia Watson, ancestors of the current family. The Castle is arguably the inspiration for Chesney Wold in one of his greatest works, Bleak House. Rockingham Castle takes its name from the village of Rockingham, where the Castle is located. Rockingham Forest was also named after Rockingham village, during the time of William the Conqueror, because of the Castle's importance as a Royal retreat. A cricket pitch lies within the grounds of the castle and is home to Old Eastonians Cricket Club. 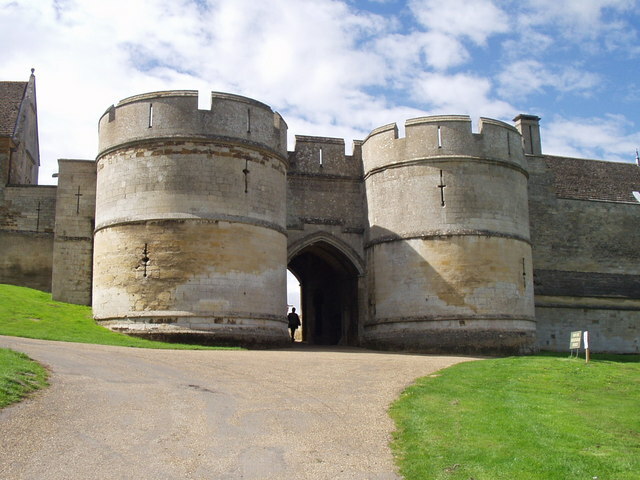 Photos of Rockingham Castle and surrounding area on geograph.